Holy Johansen! This limited CDR re-issue comes to you by way of the good folks at The League Music. 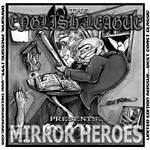 Mirror Heroes finally makes it way to cd for all those who missed it the first time around or wore out their tape. Hard slumper beats, ridiculous styles, nothing less than fresh. Features guest spots from the Chainsmokers/Shapeshifters. Production: 1, 2, 5, 8, 10, 11, 17 by Liferexall, 3, 4, 6, 7, 10, 13, 14, 15, 18, 19 by Jericho J, 12 by Deeskee. Cuts: 3, 7 by DJ Lion (Mic Edu), 4, 17 by Deeskee, 10 by Kut Masta Kurt, 11 DJ Rob One (CBS). Live Guitar on 14 by Theo Aalexopoulos.